In my house this morning: a breadcrumb trail of Angry Birds playing cards leading from my bedroom, down the hall, through the kitchen, through the patio room, to the wide-open sliding door. By threats to skull, spine, ulna, femur. Him skyward all the long way home. This week’s Poetry Friday roundup can be found at Reading to the Core. About once a week I bring my fountain pens to the kitchen tape for refilling. My reason for making this rather quick, benign chore a public affair is to take advantage of the great parenting truism: If you do it, they will copy. Huck isn’t the kind of kid who would be too keen on formal handwriting practice (does that kind of kid even exist? ), but if I get busy with some nifty writing utensil, he’s at my side in a flash, begging for a turn. Fountain pens are awesome enough, but dip pens? There’s nothing better. 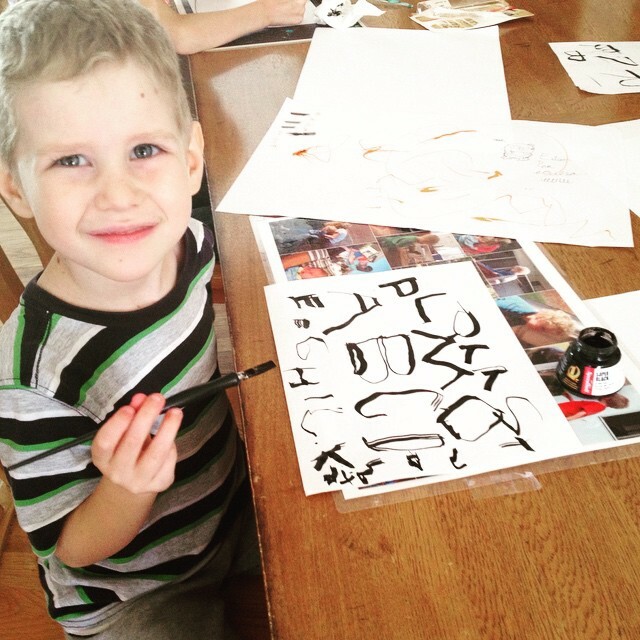 A bottle of ink, a nib with just the right amount of skritch…there’s a happy kid. I didn’t suggest the alphabet practice; he filled up the page as he chose. I tumbled to the metal brush pen (aka my new best friend) in Jonathan Twingley’s rather amazing class at Sketchbook Skool. It was swoon at first site. You get a broad line from the flat nib, or you can turn it on its side for a fine line. It’s on the messy side—likes to spatter ink if you change direction midstroke—but for me that’s part of the appeal. I use it when I’m in the mood for rough, bold lines and a bit of ink spray. Jonathan Twingley likes to fill pages and pages with large drawings and then cut out selected images and collage them together into a new piece of art—really quite magical to behold him at work. And this post offers a quite detailed look at what a steel brush nib can do. We also have a pair of glass dip pens that my parents gave me years ago with more typical pointed nibs. You can see Huck’s page of orange squiggles on the table. I know somewhere in my archives I’ve talked about the magical powers of colored chalk and a little slate, or a whiteboard and dry erase markers, for transforming otherwise dull writing into fun. Dip pens are the same principle times a hundred. Huck came to me with How to Read a Story by Kate Messner and Mark Siegel. “Mommy, will you be my reading buddy?” (That’s Step 2 in the book.) Why of course I will! He starts reading me the book. And then, halfway through, only a few pages after the sneaky video I took below, he…stopped reading out loud. Got sucked into the story and read silently for the first time. Thanks to this charming picture book, I got to be there for the moment of transition. It was magical. And yes, since he’s my youngest, a little bittersweet–the last one to cross the bridge to solo, silent immersion. But only a little bittersweet. Mostly just magical.